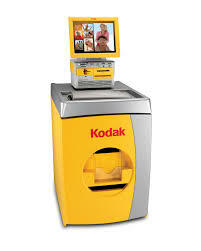 We recently upgraded our Kodak Picture Maker kiosk providing many new enhancements and tools. In addition to creating affordable Kodak-quality prints with faster image processing, you also have access to these NEW premium features. Social Networking Connectivity – You can print any of your online pictures from Facebook, Kodak Gallery, and Picasa Web Album! Photo Books – Hard-cover photo books provide a fun, new way for you to use prints from your Picture Maker to make photo gifts or a keepsake of a special event. Books are available in 4×6, 6×8, or 8×10 sizes starting at $9.95/each. Picture Movie DVDs – Use 40 to 60 of your own still images to create a unique, personalized remembrance of special events, complete with pan and zoom effects, music and titles. Kodak Picture Movie DVDs will play on any home or computer DVD player. Facial Retouch – Now you can look your best with Facial Retouch. It automatically smoothes skin tones, removes or reduces facial blemishes and wrinkles. Video Snapshots – No need to take video and stills of the same event. With Video Snapshosts, you can easily pull still pictures from your digital videos to make prints, collages, calendars, greeting cards, and more. Pet Eye Retouch – The new easy-to-use editing tool will appeal to pet lovers. It removes the flash glare from your pet’s eyes. Visit the Alpine Digital Photo Center and today!